Meet Ben Ackland, new head chef at the Yew Tree in the idyllic village of Bunbury. He’s worked around the world, from the The Ivy and Soho House to multi-million-pound venues in Texas and private dining on the Côte d’Azur, but Cheshire’s brilliant produce has drawn him to this idyllic 19th century free house, known for its food and warm welcome. “When I arrived, I wasted no time in introducing myself to as many local producers as possible,” he explains. He’s already hard at work, partnering closely with local suppliers to create seasonal dishes using the finest ingredients available. “When it comes to cooking, my style is very much modern British, so my goal was to revive classic pub dishes by adding quirky elements influenced by my travels around the world. I couldn’t resist throwing in a few curve balls to surprise both our regulars and our new customers,” he says. For those who enjoy sharing small plates, tasty dishes include chef’s onion rings with Bloody Mary ketchup and haggis sausage roll with whisky mayonnaise. Meanwhile, pan-fried scallop with crispy black pudding, smoked bacon and baked apple jam features among the starters, and don’t miss the Bunbury burger (a smoky maple bacon cheeseburger) and Joinson’s 28-day dry-aged ribeye steak. Vegetarian and vegan dishes also feature, such as Waldorf salad and baked aubergine and tomato gratin. But diners should remember to leave room for dessert because the sweet courses are also hard to resist, especially the Baileys crème brûlée and the chef’s homemade carrot cake. Ben adds: “Creating the menu involved a long process of making notes, experimenting, sourcing ingredients and, the best bit, the tasting – and I’m proud of the finished result. 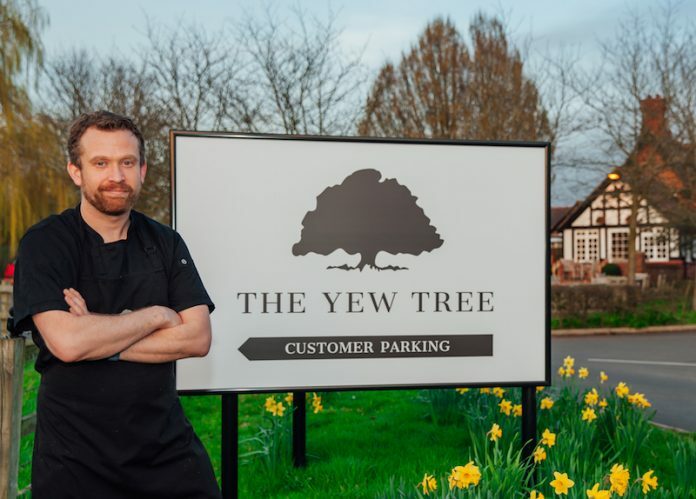 Sam Evans, general manager at The Yew Tree Bunbury, says the new menu has been a hit with pub regulars and foodies alike: “Word is spreading fast, not only in the local area, but further afield, and the feedback has been extremely positive. Now owned by the Chester Race Company, it’s not just The Yew Tree’s menu that has been given a revamp. The pub’s interior has also undergone a makeover, to give it a home-from-home feel. And with dogs’ welcome at the bar too, it’s the perfect location for a drink or meal, before or after an invigorating walk in the picturesque Cheshire countryside.